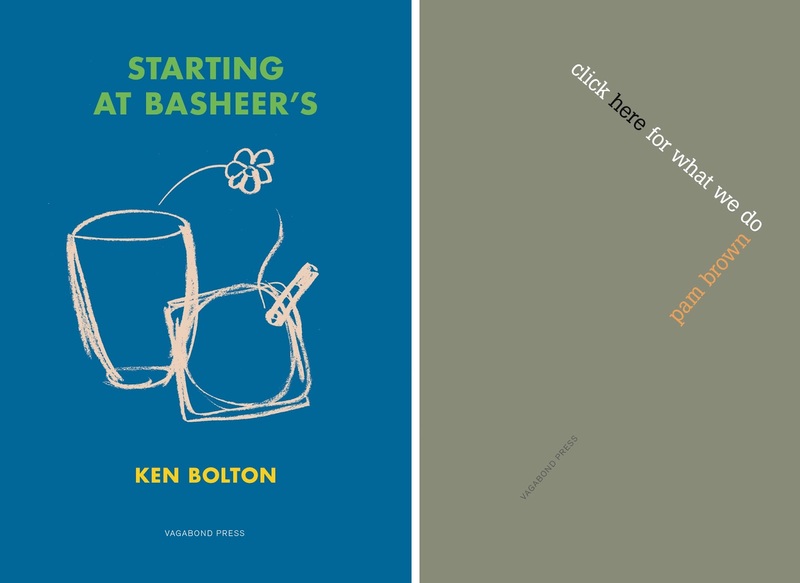 Starting At Basheer’s shows a determined ‘tightening up’ of the language and sentiment brought to writing and thinking: the book responds to growing tensions and growing animosities felt in Australian society: bleakly reductivist withdrawals of sympathy, and of automatic goodwill, are tested, examined and worked around. Still, the poems remain open to playfulness & aesthetic opportunism, which is good—so, jokes, rapid shifts of direction and attention, allusions to popular culture and to literature and the visual arts. Characteristically the poems think through experiences, issues, social, ethical and aesthetic problems, using the lens of the everyday. And, here's a plus, at the same time they refuse to preclude any one register—high, low, or middling, the casual or the seriously proposed, the specialist or the amateur. At all times the ‘Self’, the ‘citizen, is weighed and judged in the light of the imagined Other. A loony tune, something of a zany, a yo-yo with money, Ken Bolton has been variously described. In truth, he is a curious figure— irascible, intemperate, vituperative, yet devoted, apparently, to an idea of 'the Beautiful', as somehow defined. Lord David Cecil held him to be 'the Hulk Hogan des nos jours' — and found in him 'a Pol Pot, perhaps the very Pol Pot, of the aesthetic.' 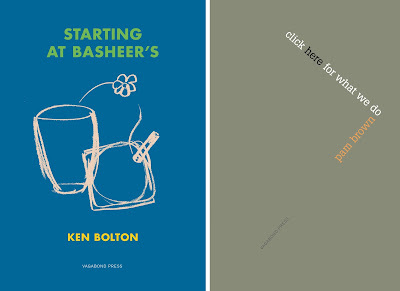 Bolton has published many books, the most recent published in 2017 - Lonnie's Lament (Wakefield Press) and Species of Spaces (Shearsman Books). Click here for what we do is a cluster of four loosely connected poems that are not only sceptical of the status quo's serial mendacities and hype but, in a way, they also attempt a coming to terms with the erosion of the idealistic conditions that once made non-mainstream culture, including poetry, so viable and, even, necessary. For Pam writing poetry is a habit, a disorganised ritual. Her poetic inventories begin in everyday bricolage. Real things interrupt the poems the same way thoughts and phrases do. She dismantles monumental intent and then, by mixing (rather than layering), splices the remains into a melange of imagery and thoughtful lyric. Hers is a friendly intelligence that clues in connections to the 'social' as the poems make political and personal associative links. Spurning any lofty design these poems debug the absurdities of contemporary materialism with surreptitious humour. Though disquiet is present it's usually temporary. Here, thinking about the future can be 'trickgensteinian' and yet the poems also offer a circumspect optimism. Pam Brown's many books of poetry include Text thing, Authentic Local, Dear Deliria, Home by Dark and Missing up (the latter published by Vagabond Press in 2015). Pam, a dedicated amateur, has earned a living in a range of occupations. She has been writing, collaborating, editing and publishing in diverse modes both locally and internationally for over four decades. Over the years she has moved around - living at various times in several towns and cities - but has always returned to live in the perpetually reconstructing city of Sydney. Astrid Lorange is a poet, writer and teacher from Sydney. She is the author of Eating and Speaking (Tea Party Republicans Press, 2011), 'How Reading Is Written - A Brief Index To Gertrude Stein' (Wesleyan Univ Press, 2014) and Ex (SOdpress, 2016). Download or read Ex here. Astrid also writes critical articles and essays and lectures in art theory at UNSW Art & Design. Toby Fitch is the author of Rawshock (Puncher & Wattmann 2012), which won the Grace Leven Prize for Poetry, Jerilderies (Vagabond 2014), The Bloomin’ Notions of Other & Beau (Vagabond 2016), Undulating Cloud Sonnet (SOdpress, 2017) and The Or Tree, a fictitious recreation of the fictitious poem, ‘The Oak Tree’, by Virginia Woolf’s character Orlando. See the first two chapters here. Based in Sydney, he teaches creative writing, directs the Australian Poets Festival, runs the Sappho Books poetry reading series, and is poetry editor for Overland.